The SAC Base UFO Flyovers - Oct/Nov, 1975. The Commander-in-Chief of North American Air Defense Command, November 11th, 1975. It seems that, contrary to the often cited U.S. Government claim about 'UFOs being of no defense significance', there was considerable panic about them over a period of three weeks in October and November, 1975. Several Strategic Air Command bases in the Northern U.S. were placed on a high priority alert due to repeated reports of UFOs flying at low altitude over atomic weapons storage areas and the Commander-in-Chief of North American Air Defense Command sent a four part message to NORAD about the 'intrusions' on Nov 11th (more info at links). 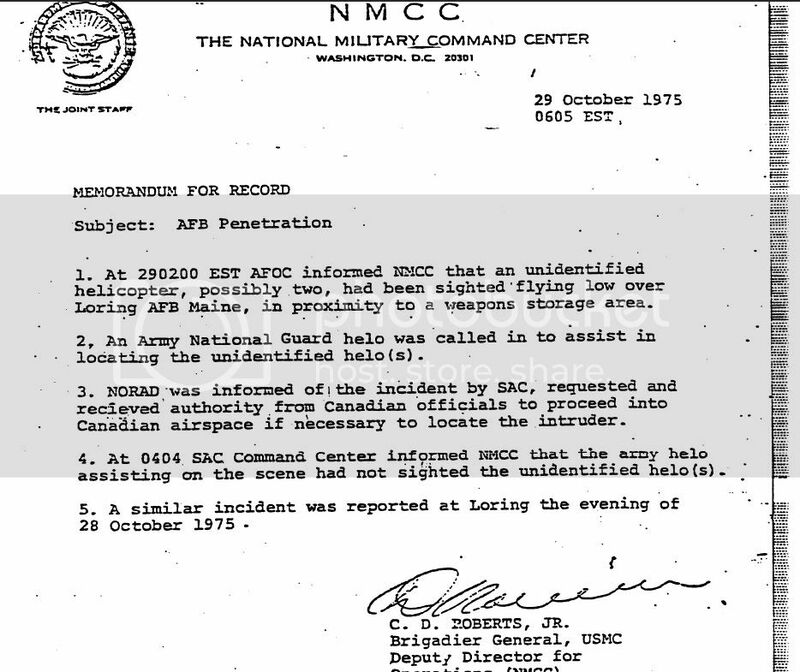 * DOD, USAF, and CIA document reveal that during October, November, and December of 1975, reliable military personnel repeatedly sighted unconventional aerial objects in the vicinity of nuclear-weapons storage areas, aircraft alert areas and nuclear-missile control facilities at Loring Air Force Base, Maine; Wurtsmith AFB Michigan; Malstrom AFB, Montana; Minot AFB, North Dakota; and Canadian Air Forces Station, Ontario. Many of the sightings were confirmed by radar. At Loring AFB, the interloper "demonstrated a clear intent on the weapons storage areas." * The incidents drew the attention of the CIA, the Joint Chiefs of Staff, and the Secretary of Defense. Though the Air Force informed the public and the press that individual sightings were isolated incidents, an Air Force document says that "Security Option III was implemented and that security measures were coordinated with fifteen (15) Air Force bases from Guam to Newfoundland. Another AF document reveals that the Air Force conducted an investigation into the incidents but found no explanation for their occurrence. Captain Zim, thanks for the reply and it's certainly a very interesting series of incidents - there's a great interview below with Lawrence Fawcett who goes into more detail about the government documents dealing with the 'incursions' - he also co-authored the excellent book 'Clear Intent' and interviewed many of the security teams who witnessed the objects. If you value genuine UFO information, and if you respect a real and honest to God "professional" investigator, then I envy your listening to this episode for the first time. The evening of February 11, 1995 I had on just retired police Lieutenant Larry Fawcett, who along with Barry Greenwood wrote one of the most important books ever on military/government UFO information and coverup - Clear Intent. This was the first of several interviews I conducted with Larry, a long time friend and respected (especially by me) professional investigator. Larry's contributions to the aspect of UFO investigations is far and wide. In this interview we touched upon (in depth) the 1975 incursions into Air Force nuclear weapons areas, Larry's inter-actions with the military, other police agencies and even the FBI. Of course there was much more. Good article karl ! Skyeagle has been telling em all this time and yet the air waves are blank with belief ! Im still on your Six Big Guy! A former base of mine, Hill AFB, UT, had responsibility toward Minuteman missiles in the field. The fact that those missiles were shutdown, proves that UFOs were a significant defense issue regarding national security. I have been telling the skeptics about those missile incidents for years, but it seemed that my messages were falling on deaf ears. "Some people say I've done all right for a girl." --Melanie "Brand New Key." Finally something credible! Thank you! I haven't looked at everything in its entirety, like the video and the mp3s. I have a sucky connection that won't let me hear the mp3s. 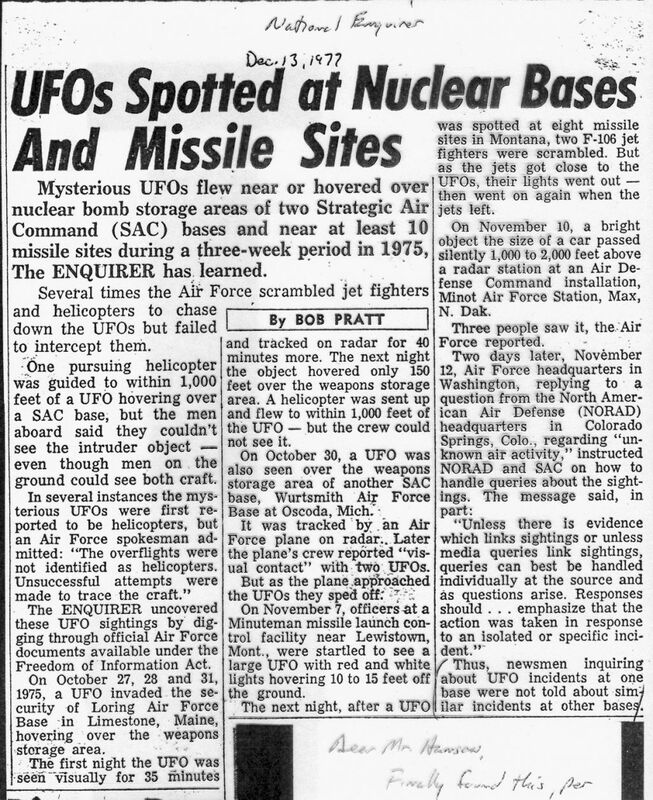 What I gather is that the Air Force was pretty much powerless against the UFOs over the sites. In one case the pilot couldn't even see the object in front of them when it was still visible from the ground! In another case the fighters appeared to pass right through the object/s. What can you do against something like that other than report it? Needless to say it's obviously something they couldn't even begin to understand. I could understand the reluctance to report this to the media. Was our military going to admit to the world that it couldn't do anything about unknown objects seen over nuclear sites? And how could they assess a threat that didn't even appear to have substance? That is, if I understood correctly because I read part of it while I was sleepy. 1975: STRATEGIC AIR COMMAND BASES UFO ALERT. *"October 28, Loring AFB, Maine. Unknown craft with a white flashing light and an amber or orange light. Red and orange object, about four car-lengths long. Moving in jerky motions, stopped and hovered. The object looked like all the colors were blended together; the object was solid. *"November 7, Malmstrom AFB, Montana. A Sabotage Alert Team described seeing a brightly glowing orange, football field-sized disc that illuminated the Minuteman ICBM missile site. As F-106 jet interceptors approached, the UFO took off straight up, NORAD radar tracking it to an altitude of 200,000 feet [38 miles or 60 km.]. An object... emitted a light which illuminated the site driveway. The orange-gold object overhead also has small lights on it. *"November 8, Malmstrom AFB. Radar showed up to 7 objects at 9,500 to 15,000 feet [2,900 m. to 4,700 m.]. Ground witnesses reported lights and the sound of jet engines, but radar showed objects flying at only 7 kts. [8 mph or 13 km./hr.]. *"November 10, Minot AFB, North Dakota. A bright, noiseless object about the size of a car buzzed the base at 1,000-2,000 feet [300-600 m.]. And along came a spider. We cannot do anything, even after our missiles were shut down. In the Case of Minot AFB, a B-52 bomber flew right next to a UFO and the co-pilot look through one of its windows as they flew by. The aircrew were featured on ABC News, which was hosted by Peter Jennings. The co-pilot stated that he knew then, that the UFO was extraterrestrial. Take a minute to read through the PDF's and notice the bits about helicopters, border patrol, local police and coordinating with canadian law inforcement. The fantastic story in the youtube video concerning Malmstrom AFB and echo flight in 1967 is utter B.S. concocted by a retired air force sergeant named Robert Salas who was part of a missile launch crew that experienced an electrical malfunction caused by the rural power grid which temporarily disabled their ability to launch a few of the ICBM's under their control. I've posted the complete document earlier in this thread which goes into great detail complete with technical notes from the Boeing engineers responsible for the design of the launch system and missiles themselves. The muddying of the history of the cold war to support the UFO/E.T. hypothesis is a pet peeve of mine. The men and woman of the strategic air command and tactical air command towed the line during what was possibly the greatest threat to the history of our species, the nuclear hair trigger of the MAD doctrine (mutually assured destruction). As attractive as the classified nature of strategic defense is to those who would sell us a book of the fantastic I would hope that most see these "incidents" for what they are, tall tales and exaggerations. No muddying of the incidents. The incidents happened as reported. The skeptics are the folks muddying waters. Presumably whenever these kinds of national security UFO incidents occurred that affected military equipment there were investigations by contractors who built or maintained the equipment, and the UFO aspects were compartmented off. At a higher level these reports could be read by someone cleared to know about the UFO details, and they could ignore the perfunctory denials of UFO activity written into the contractor studies. You see, a similar incident happened to another unit earlier. Note acknowledgment of UFOs overlying military installations, and note that natural phenomena and aerial vehicles were ruled out. Visual sightings and radar tracking of UFOs in the vicinity of military installations have been reported since the beginning of the modern era. The number and nature of most of these events has been kept from the public by military security, but on occasion information has been released, although its significance is usually played down. From late October through the middle of November 1975, high-security bases along the U.S.-Canada border were the scene of intrusions of what were euphemistically called "mystery helicopters," despite their unhelicopter-like appearance and behavior. It's by no means the first time the U.S. Gov has referred to UFOs as 'mystery helicopters' in official documentation (although many of the reported flight characteristics and object descriptions appear to completely rule out helicopters) - there are also other reports from the Vietnam War where this term has been routinely abused and if you're interested, Lawrence Fawcett goes into more detail about the subject in the linked radio interview posted above. "He saw a cigar shaped object with red, green and white flashing lights, going up and down and making sharp turns"
"She saw an object hovering at tree top level in a clearing near power lines one half miles distant. It had four red lights in diamond shape and two white flashing lights"
"It was rotating -going back and forth at a high altitude and had white, blue and red lights"
"In a partly cloudy sky, he saw one bright object about 70% elevation, like a cup in a bowl. He was looking at it through binoculars"
"They were followed by a huge oval shaped object with white blinking lights"
Skyeagle -don't know if you've seen this one matey but here's another U.S. Government document which describes another UFO incident over another USAF command base just two months later - this is yet another report in which the object description bears absolutely no resemblance to a helicopter. 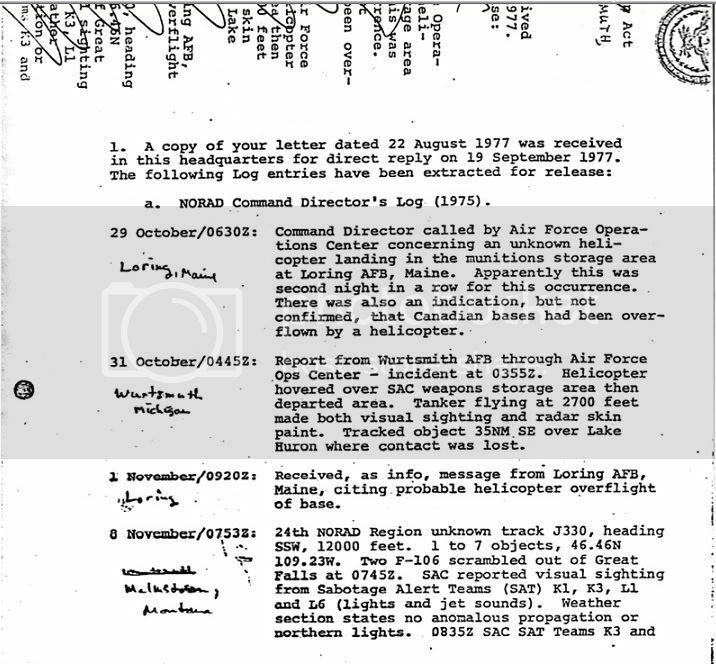 Cannon USAF TAC Base -UFO Document. Objects being described as "25 yards in diameter, gold or silver in color with blue light on top, hole in middle, and red light on bottom". Did you bother watching the video before you posted it? I read through the documents and links you provided. I suggest you take a second, more critical look as well. If you read what's there, it takes a pretty big stretch to connect the dots from reporting helicopter sightings at the U.S./Canadian border to the FBI and Border Patrol to evidence of E.T. interference with the U.S. Strategic arsenal. As I stated, there is no factual basis to support the E.T. nuclear claim. Robert Salas wrote a book of fiction peddled as fact to cash in on the UFO craze, got an interview on Larry King and nobody bothered to check his story so now we have another fantasy story being peddled as history. If Stanton Friedman can do it, why cant everyone? Its that simple. I never even watched the video because of my sucky connection, but I did read the documents. Even if you throw out the helicopter part, there is still enough in the rest of the documents that made me go "hmm." I don't know anything about government documents, but they look legitimate to me. I just don't know. That was several years before my time but it sounds like a pretty scary series of events to me! [if you read what's there, it takes a pretty big stretch to connect the dots from reporting helicopter sightings at the U.S./Canadian border to the FBI and Border Patrol to evidence of E.T. interference with the U.S. Strategic arsenal. Are you being purposefully disingenuous? It also appears that, as well as several Strategic Air Command bases going on high priority alert due to these incidents - there was also an investigation by the USAF who couldn't find an explanation. Can you take a good, long read of following two paragraphs and explain what it is you don't agree with? There's a report below dealing with Loring AFB -if you've got a sincere interest in the subject then I'd also suggest looking into incidents at Minot and Cannon as well as the work of Lawrence Fawcett and Barry Greenwood. As Lewis was watching the UFO, Staff Sergeant James P. Sampley of the 2192nd Communications Squadron was handling the duties at the base control tower. He got a radar return from the UFO, and calculated it at 10 or more miles east-northeast of the base. Sampley's orders in case of a UFO were to hail the craft through all military and civilian radio bands, which he did. There would be no response from the unknown object. He continued to monitor the return on his screen as the UFO began to circle the base. Ultimately, it moved to within 300 yards of the nuclear storage area, which of course, was highly restricted.. The UFO would continue to fly around the Loring field for forty more minutes, before if left its course, and took off in the direction of Grand Falls, New Brunswick. At about 12 miles distance from Loring, it left the radar screens. Inconceivably, the very next night at the same exact time, the UFO was back. Lewis was again manning the radar screen, along with Sergeants Blakeslee and Long. The UFO was coming from north of the base, at 3,000 feet. It came to within 3 miles of Loring, sporting orange, red, and white flashing lights. Lewis, Blakeslee, and Long all saw the UFO, and Lewis again reported the object to Loring command. I'm starting to wonder if one of us is as well? Are you bothering to even read any of the source material you are posting? From the first page of the NMCC document you posted discussing another.... unidentified helicopter. 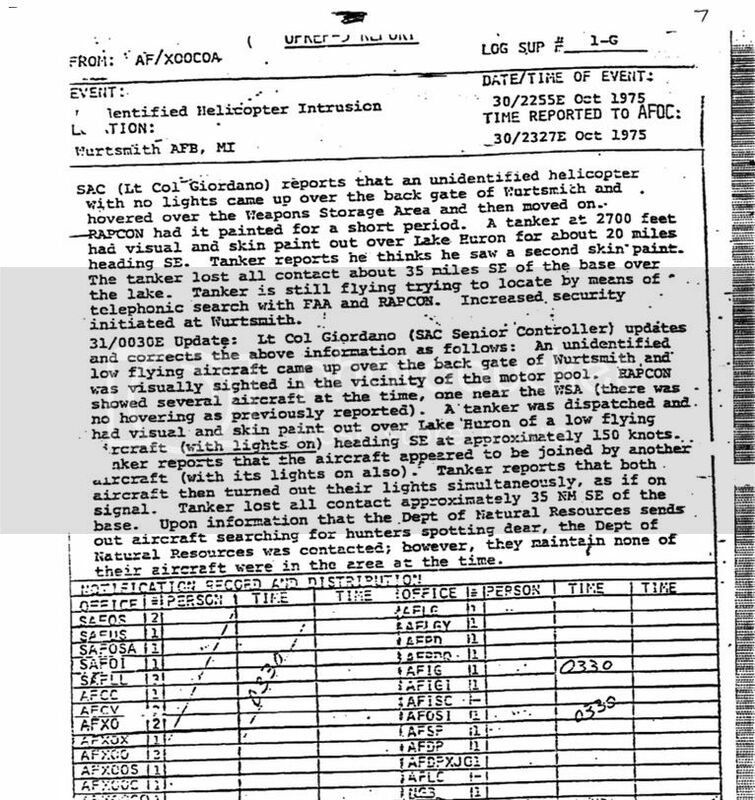 And lastly, from the first page of the third document you posted.... yet another reference to an unidentified helicopter. Note, that "helicopter" is mentioned. That is just another form of cover-up the military. No helicopters were involved for they would have have been tracked until landing. Helicopters were also used to hide our UFO sightings in Vietnam, so I know what I am talking about when I see "helicopters' mentioned in military UFO reports. The use of the words: "helicopter/helicopters/aircraft" are just means we use to keep unwanted attention away. There are those who have no idea just how easy they can be fooled by our military services. There was no way those UFOs were helicopters. That proves just how easy the Air Force can pull the wool over the eyes to those who allowed the Air Force to do just that. UFOs in reports in Vietnam, were also mentioned in UFO reports as helicopters, but we knew better, and knew that the crafts were not helicopters at all, but they were mentioned in UFO reports to keep unwanted attention away. Drunken Parrot, I very much doubt you've listened to any of the military witness reports but, since you chose to ignore the question, I take it you now agree with the paragraphs below? The reason I asked if you had actualy read the reports is it quite clearly states these unidentified flying objects were witnessed near highly restricted military areas - not just 'somewhere near the US/Canadian border'. If the USAF investigation couldn't find an explanation for these incursions I'm wondering what you think the reasons are why 'helicopters' should be showing a 'clear intent' towards nuclear weapon storage areas? "It is our opinion that the unknown helicopter had demonstrated a clear intent in the weapons storage area"
Here are some of the descriptions of 'helicopters' taken from the documents and links - there's also some very intriguing eye-witness testimony from military security teams that you should seriously think about reading here . This 13-page report with 59 documents would not be possible without the help of Dan Wilson, Brad Sparks, Barry Greenwood and Larry Fawcett. My work on this compilation began many months ago because of a need for a very comprehensive listing of these important incidents. 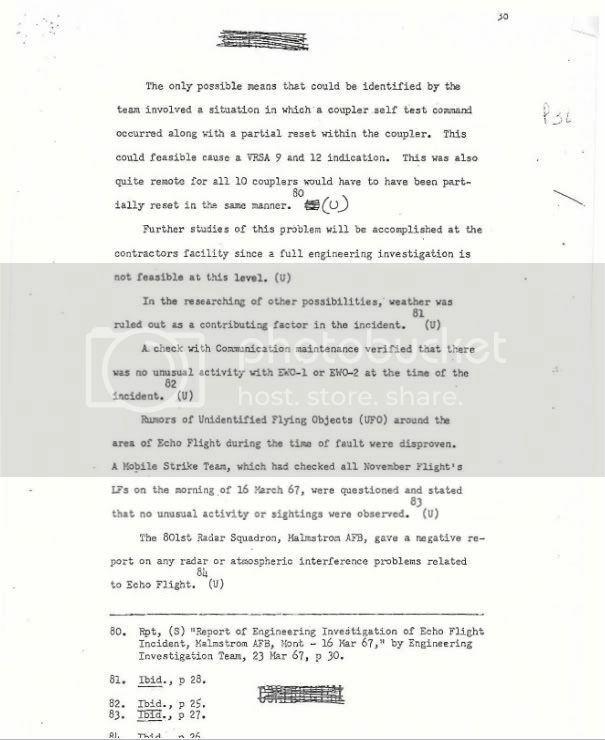 This report is part of the 30-page 1975 UFO Chronology but covers only the events during the northern tier overflights so that the importance of this intrusion would not be lost in the shuffle. The official documents provided in this report list the cause of these incidents (in many cases) as "helicopters". It would soon be obvious, and surely now after 30-plus years, that these were DEFINITELY NOT any type of helicopter. The times listed in the documents are ZULU, so local time had to be calculated so we could use the listings in the proper chronological order. Many times this actually changed the DATE of the sighting. To summarize briefly, radar picked up the craft over the weapons storage area and followed it to the southeast, where the task of identification was handed over to the KC-135 commander. The KC-135 crew picked it up visually and on radar. Taylor, in his statement to Cahill, never once called the craft a helicopter, but called it "a UFO" and an "object." He said that their speed was about 200 knots, and in each attempt to close with the object, "it would speed away from us." Taylor added that when they were heading back to Wurtsmith, "we turned back in the direction of the UFO, and it really took off... doing approximately 1,000 knots." One thousand knots. Certainly no helicopter ever built could do such a thing. The object looked like all the colors were blending together, as if you were looking at a desert scene. You see waves of heat rising off the desert floor. This is what I saw. There were these waves in front of the object and all the colors were blending together. The object was solid and we could not hear any noise coming from it. SAC CP reports UFO 20 miles southeast of Lewiston, orange white disc object. 24th NORAD Region surveillance checking area. Received a call from the 341st Strategic Air Command Post (SAC CP), saying that the following missile locations reported seeing a large red to orange to yellow object. The orange/gold object overhead also has small lights on it. SAC also advises female civilian reports having seen an object bearing south from her position six miles west of Lewiston. L-1 reports that the object to their northeast seems to be issuing a black object from it, tubular in shape. In all this time, surveillance has not been able to detect any sort of track except for known traffic. I'd also be interested why you think NORAD were taking the time to collate civilian UFO sightings from around the same time whilst on high priority alert? He saw a cigar shaped object with red, green and white flashing lights, going up and down and making sharp turns"
Just as an afterthought, there is also this very interesting UFO report from Minot AFB's Nuclear Weapon storage areas in 1968 - after taking the time to acquaint yourself with the facts surrounding the incident, would you say this object was also a helicopter? It just goes to show just how easily the Air Force can, and has, duped the public on UFOs. Here, the UFOs were described as helicopters, when the Air Force knew full well that no helicopters were involved. I have repeatedly warned skeptics not to go into 'debunk mode,' if they are unware of the rest of the story.